Thought I’d check what the actual sunrise and sunset times were for today. Sunrise (PDT) was at 6:57am and sunset (PDT) was at 7:05pm. What? Today is the vernal equinox; aren’t the day and the night supposed to be equal? I guess I have another research project; I’ll find the answer. According to the World Clock and Astronomy, it was the 16th that had 7:02am sunrise and 7:02pm sunset. Well, I’ve just got to get this figured out. I’ll share what I find out. As for today’s adventure . . . I posted that I was planning to either make it a really short day by driving only to San Bernardino, or Glendale. I left Desert Hot Springs at 10:45, which got me to the San Bernardino area by about noon. “Well,” said I to Lacy and myself, “I think we need to continue to Glendale.” So we stayed on I-10 and headed west towards Glendale. Somewhere between San Bernardino and Glendale I admitted to the kids and myself that what I was really uncomfortable with that was causing my hemming and hawing was the infamous Grapevine. 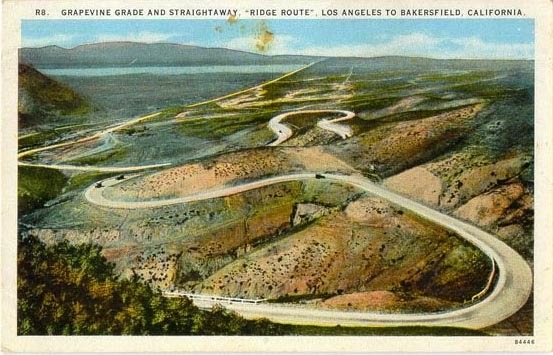 For those followers who are unfamiliar with The Grapevine, it is a grade that essentially begins at the mouth of Grapevine Canyon at an altitude of very close to sea level, and ascends the canyon to Tejon Pass in the Tehachapi Mountains via I-5. The grade is named for the canyon it passes through with its wild grapes that still grow along the original road. The Spanish name is La Cañada de las Uvas(the mountain pass of the grapes). The highest point is at an elevation of 4,431 feet and the grades are 6%+ both uphill and down. 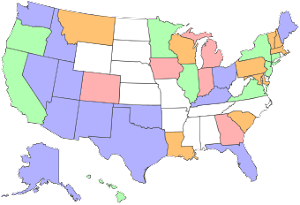 It’s the major route for the long haul truckers who must use it for transporting goods between Southern and Northern California and all of the Pacific Northwest. Closure for any reason causes a formidable disruption to traffic; and, it does occasionally close due to heavy snowfall during winter storms. 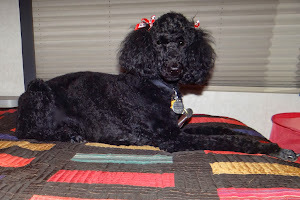 These photos are from Google Images - I was too busy to take photos! Sometime after passing Glendale, I decided that the way to calm down about traversing the Grapevine was to "just do it!" So we pulled off a little north of Glendale for a snack, gas and potty break and headed on to I-5N and the Grapevine. End to end it's about 40 miles; but takes at least an hour to cover the distance in a car. Floribunda just hung in there with all the big trucks, at times going 35mph on some uphill grades. There are signs instructing drivers to turn off air conditioners for a number of miles to prevent overheating, and they even supply water stations for overheated radiators. I also attempted to do a large part of my downhill braking using my lower gears, and thus, hopefully saving some brake pad wear. The road is curvy and the downhill portions can be hairy; I chose to stay in the right lane even if I had to go slower than normal (behind a truck). 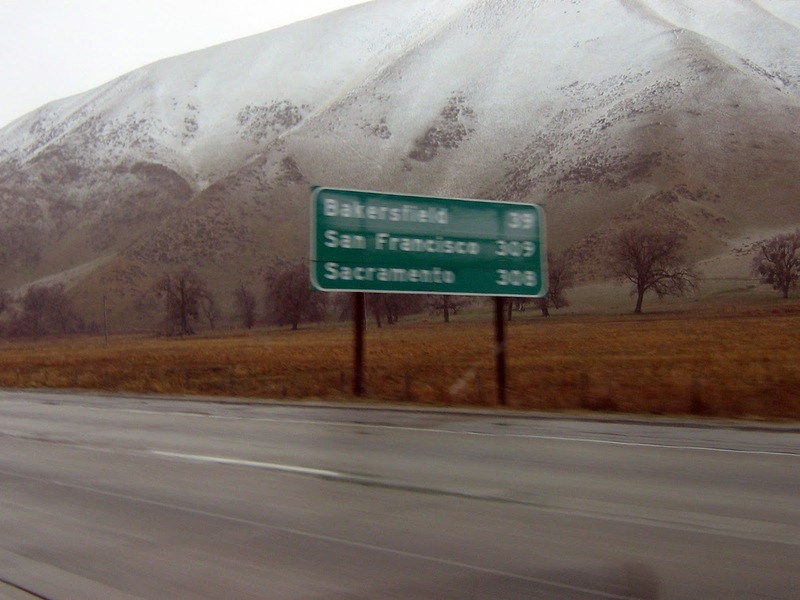 Along about the time I saw the sign (above) that Bakersfield was 39 miles, I made the decision to head there to look for an RV park. I've stayed in Bakersfield in my Toyota Dolphin but couldn't remember the name of the park. So, when I found Bakersfield River Run Park, online, it was easy access from Highway 99, off I-5 and it's really lovely. The grass is green green, the trees are all in leaf, the sites are paved with lawn in between each site, and it's $31 - not bad. 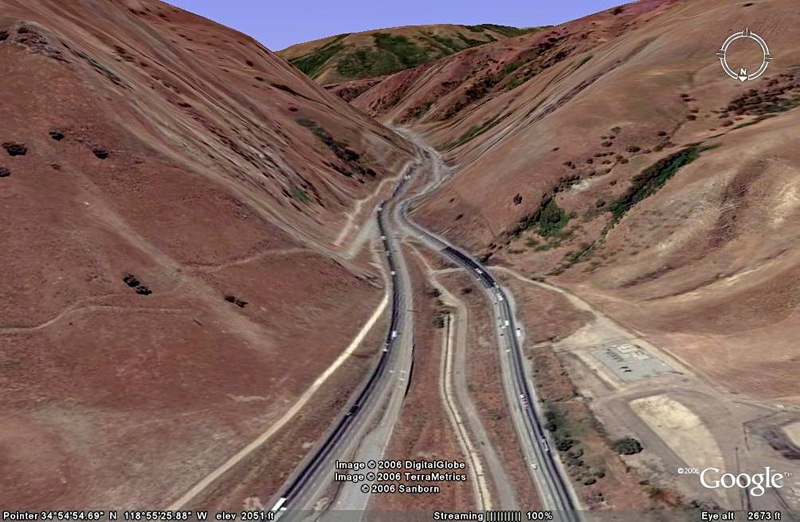 Tomorrow I could backtrack to connect with I-5; but I think I've decided to head to the Sacramento area on Highway 99N. It takes me through the Central Valley, but passes through several cities and towns; some you may be familiar with: Delano, Fresno, Tulare, Visalia, Madera, Chowchilla, Merced, Modesto, Stockton, and up into South Sacramento. 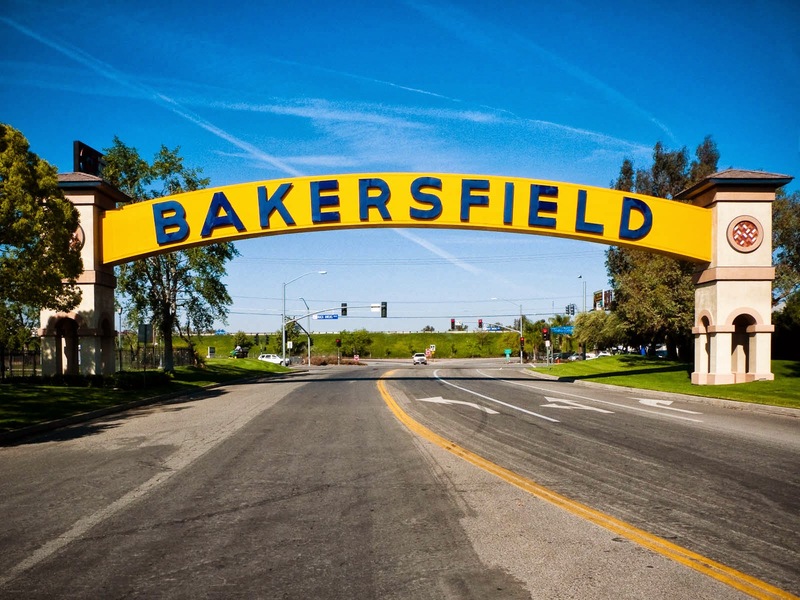 Over the 44-year period between 1970 and 2014, Bakersfield has grown 400% (from 70,000 to 545,000),[making it one of the fastest growing cities in California. It was 90F when I arrived here at 4:30; it's cooled down to about 70F right now and will probably cool more by early morning. Life is good. 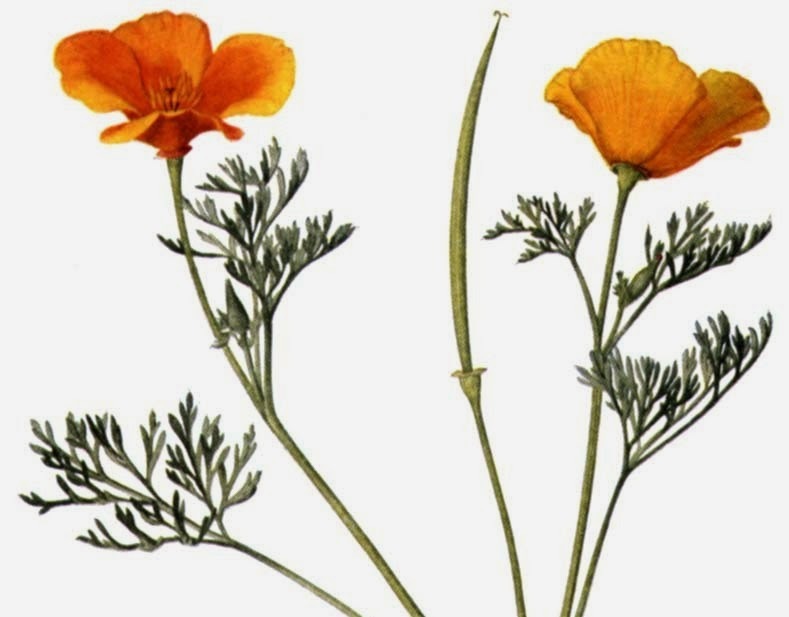 I'll leave you with a couple of photos of the State flower, the California Poppy; they're starting to pop up and should be in full bloom in a few weeks. That's all for now. I need to research this equinox discrepancy! Thanks Brenda. We simply MUST plan a get-together in the next few months. Looks like you have just about reached home plate. In my current form of travel I'll not get there until tomorrow. Two days to cover 300 miles! That's nice and easy; the weather's super and, unfortunately for most, no rain in the prediction. I remember in the old days when the poppies grew along the road everywhere. Where was I one time ... all the date palms ... well, shoot.. I'm going to look that up... Indigo? Indio... very interesting but just not a desert person ... that was about the only time I drove the desert route rather than the coast route... Joshua Tree and so forth... Palm Springs. 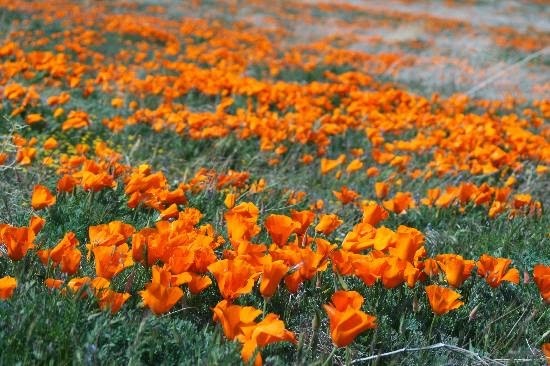 Your poppy photo is so vibrant - I have (what I think are) California Poppies here in my site, but they aren't as brilliant. I always love driving the Grapevine - once I'm on it, it's just so easy - no off ramps, no on ramps, no traffic lights. I, too stay in the slow lane and then go around any slower traffic. The only thing that stops me from going that was is when it snows in that area. Of course, I have a big engine and I'm not towing, so that's an advantage. There are also enough lanes that I don't worry about slowing anyone else down, or getting around a slow driver. My nemesis was the I-8 from Hot Springs or Quartzsite LTVAs to San Diego - going through those mountains. The first two trips I hated it - once racing from Quartzsite to San Diego to the ER for surgery that night and the next year coming from San Diego to Hot Springs LTVA in high winds through the mountains and ending up with tendonitis in both hands and a split on my thumb for 5 months. This year I played a mind game with myself. I told myself I was looking forward to that beautiful drive, I'd go slow, stop if and when I wanted, and wasn't going to dread it at all. One of those "Act as if" things. Not surprisingly, I was in San Diego County before I knew it. A much easier drive than I expected. Just doing some catch up on your posts my friend! We used to get trucks stuck on the Grapevine all the time when I was in transportation!! I applaud your courage and take charge attitude. You are "da bomb"!!! !